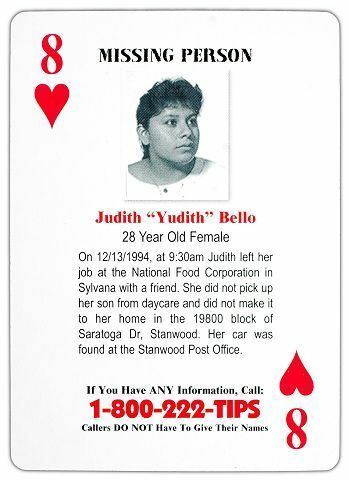 Judith Bello Medina, 28, was last seen leaving her job at National Food Corp. in Stanwood, Washington around 9:30 a.m. on December 13, 1993. Her car was found at the Stanwood Post Office in Washington. The fact she never picked up her 3-year-old son from day care seemed unlike her and authorities considered her disappearance suspicious. The family also hasn’t seen Bello’s son, because shortly after she disappeared her husband took him away. The boy, called his grandmother in Mexico before she died a few years ago, Daniel Bello said. Then this week, the Snohomish County sheriff’s detective received a phone message from a woman claiming to be Judith Bello and that she was living in California. She said she called after seeing her profile on the sheriff’s office website. Detectives spoke with her family and are confident that the woman is Judith.